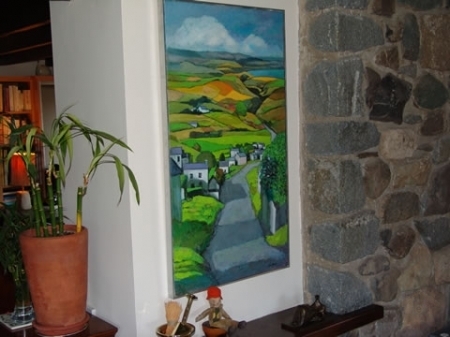 A few miles from Y Goeden Eirin, we have a small cottage by the sea in the village of Pontllyfni (off the A499 road). 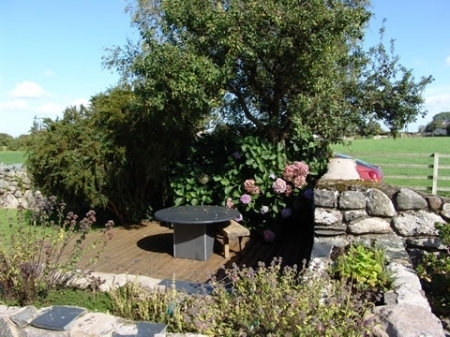 It is in a magnificent location, with the small garden opening on to the beach, and Ynys Llanddwyn in Anglesey just across the sea. Magical views of the sunset can be seen from the lounge window. This is a compact cottage, but it can accommodate five, in a double room, a twin-bedded room and a single room. There is a bathroom with a shower above the bath. 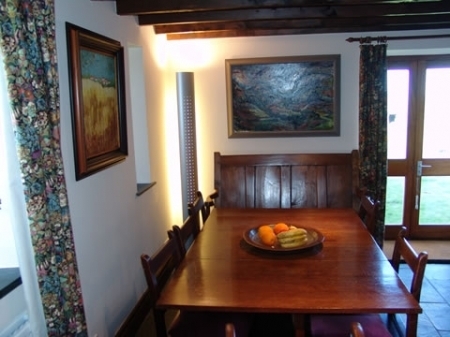 In the kitchen there is an oak dining table, modern kitchen units, a fridge/freezer, an electric oven and hob, a microwave, a dishwasher, and all that is required in a self-catering cottage. If you don’t want to cook your own food, you can come over to Y Goeden Eirin for dinner, but only by prior arrangement. The lounge is homely, with a granite fireplace and an open log or coal fire, but there are also electric fires available to heat the rooms.